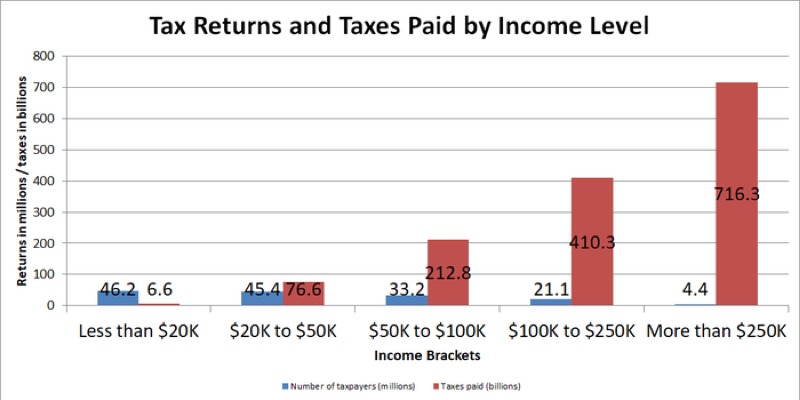 How Do Your Taxes and Income Compare to Other Taxpayers? As the 4thquarter of 2018 approaches, it’s time to make final preparations so you’re in the best possible tax position before the year’s end. As your focus turns to taxes, it’s natural to wonder where you stand compared with your peers. Do you rate as one of the top earners? Are you paying your “fair share” of taxes or did you pay too much? The IRS hasn’t released data on taxes paid for 2017 yet, but information for 2016 offers a revealing look at how your taxes and income compare with other taxpayers. 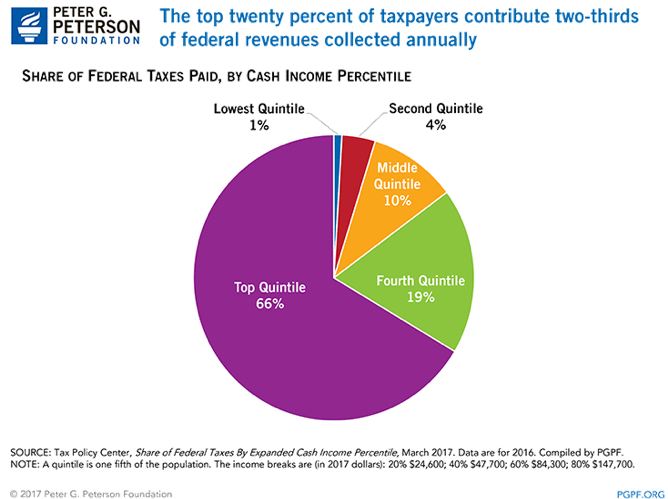 21.1 million taxpayers had an adjusted gross income between $100k and $250k, and paid $410.3 billion in taxes. Just 4.4 million Americans were in the top income level, with an adjusted gross income of more than $250,000. That amounts to less than 3 percent of taxpayers, yet the top earner group accounted for more than half of all taxes paid, just over $716 billion. Around 46 million Americans were in the lowest income bracket with an adjusted gross income less than $20,000. More than 30 percent of taxpayers were in this income level, but they accounted for just $6.6 billion in taxes. The average American paid 14% of their household income in personal taxes in 2016. This comes to $10,489 when you include $8,367 in federal taxes, $2,046 in state and local taxes, and $75 from smaller taxes such as personal property taxes, vehicle taxes, etc. This doesn’t include sales tax, which varies widely depending on your location and personal shopping habits, or payroll taxes. Because we have a progressive tax system, Americans with the highest income levels are supposed to pay the highest tax rates. 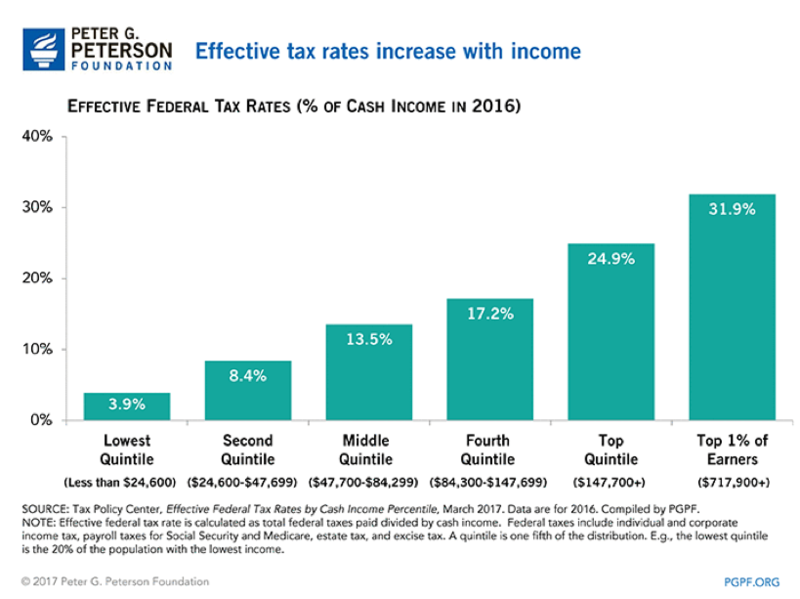 The lowest fifth of taxpayers, those making less than $24,600, paid an effective federal tax rate of 3.9%, while the top 20 percent of earners (those making more than $147,700) paid a tax rate of almost 25%. The top 1% of earners, those making $717,900+, paid a federal tax rate of 31.9%. One of the misconceptions about taxes is that top earners avoid paying their share of taxes. Actually, the top earners pay the majority of taxes. The top fifth of earners paid 66% of federal taxes, while the bottom 60 percent of taxpayers (those earning $84,299 or less) contributed just 15% of federal taxes. Those earning between $47,700 and $84,299 contributed the remaining 19%. If you would like some help with tax-saving strategies for 2018, reach out to Matt Logan at www.mattloganinc.com or call 336-540-9700.